Discovering if this highly toxic, widely used material is present in any area you may want to demo is absolutely necessary. Learn why—and how—right here. For a century, the naturally occurring fibrous silicate mineral asbestos was a mainstay of the building industry, used to create products of all kinds. Due to its strength and heat-resistance, it was widely used in flooring (including vinyl tiles), popcorn ceilings, insulation, concrete, ductwork, and much more. Like a sleeping monster, asbestos lurking in building materials poses no risks unless and until it’s disturbed, when its dust becomes extremely dangerous—so it’s crucial to test for asbestos prior to any demolition. Otherwise, the microscopic fibrils in asbestos are so abrasive once broken down that, if inhaled, they can cause lung-scarring illnesses and even lung cancer. Because asbestos can’t be seen with the naked eye, materials must be submitted to an EPA-certified laboratory for testing prior to a remodel. Even removing a sample to send to the EPA requires stringent precautions, and in many states it’s illegal to do sample removal yourself. In nearly all states, if you live in an attached house, testing and sample removal generally requires EPA-certified contractors. If your state does allow self-gathering of samples in detached housing, you can purchase a kit for between $30 to $60 or pick up the supplies to do so yourself, making sure to follow these instructions for how to test for asbestos to the letter. Note: Despite evidence of toxicity first arising in 1899, asbestos remained widely in use in a vast number of construction materials until the 1980s and continues to have construction applications to this day (see a complete list here). Keep in mind that asbestos use was so pervasive and insidious, it could be in nearly anything but the wood in your home—from countertops to insulation, wiring, carpet underlay, and more. If you have widespread asbestos concerns, the wisest move is to have a contractor perform a thorough testing before any demo begins. Do not attempt to clean any item or area you intend to collect a sample from, in case asbestos also exists in the surface dust. Ensure dead, still air in your work area so that any potential fibers, which can be microscopic, won’t become airborne. Shut all the windows and doors and turn off all fans, heaters, and air conditioning systems that can circulate air. Don all of your protective gear: face mask, gloves, coveralls (or long sleeves and long pants), and shoe covers. You’ll need to discard whatever you’re wearing during asbestos removal, so spending $5 to $10 on disposables is well worth it. Do not allow anyone in the area who is not wearing protective gear. Lay plastic sheeting around the work area to catch any potential asbestos dust that may settle. Spray the entire area thoroughly with water, so that all the surfaces are misted and the air is humid. This will help ensure that any dust created will quickly subside. Working as passively as possible to minimize dust, use a chisel or utility knife to loosen a sample of the material you want tested. The sample must weigh between 5 grams and 100 grams (just under ¼ lb). Without touching or disturbing the loosened sample, spray it down with water, and mist the air around you. Place a wet wipe in the mouth of the pliers, which will prevent microscopic fibers from sticking to the pliers. Carefully pick up the sample with the pliers and place it inside a zip-locking plastic bag. Drop the wet wipe in as well. Seal the plastic bag. At the top of the bag, neatly print the following information in reasonably small letters: where the sample was taken, the date of collection, and what the sample contains. Now place this sealed bag into a second zip-locking plastic bag to be sure it stays secure. Mist the air one more time to ensure dust settles. Carefully fold up the plastic sheeting and dispose of it in a plastic trash bag. Fold down the top of the plastic bag and securely tape it shut to contain any fibers. Thoroughly vacuum the area. Once done, carefully replace the vacuum bag and dispose of the old one in a plastic trash bag, taping the bag shut as you did with the plastic sheet, to contain particles. If you use a bagless vacuum, put the canister inside a trash bag and carefully tap out all dirt and dust. Use a wet rag to thoroughly wipe the canister down. Dispose of this rag in a plastic trash bag. Repeat the wipe-down with a wet wipe or two, just to be thorough. Dispose of these along with the rag. Clean the entire work area and anything nearby where dust may have landed with another wet rag. Dispose of the rag with the others, and tape that bag closed. Seal the area from which you took the sample by applying a thick, thorough coat of any kind of paint. When the paint dries it will prevent any more dust from kicking up. Discard the paintbrush in a plastic bag. Carefully remove your coveralls or clothes, facemask, and gloves, and dispose of them in the trash bag with the paint brush and tape it up. Dispose of all trash correctly. Check the National Voluntary Laboratory Accreditation Program’s website for an EPA-certified asbestos-testing lab that will take your sample. You may require a printer to print out a submission declaration form. Follow their instructions for submitting your samples. It can take three weeks or more for a response to a sample collected by a homeowner, so plan ahead, and be patient. Samples collected by EPA-certified professionals can be tested in as little as 48 hours, which may make the premium of paying a pro worth it for you. If your sample tests positive for asbestos: Find an EPA-certified contractor to begin asbestos removal. It is illegal in many states to do asbestos removal yourself, and you can be heavily fined for doing so. 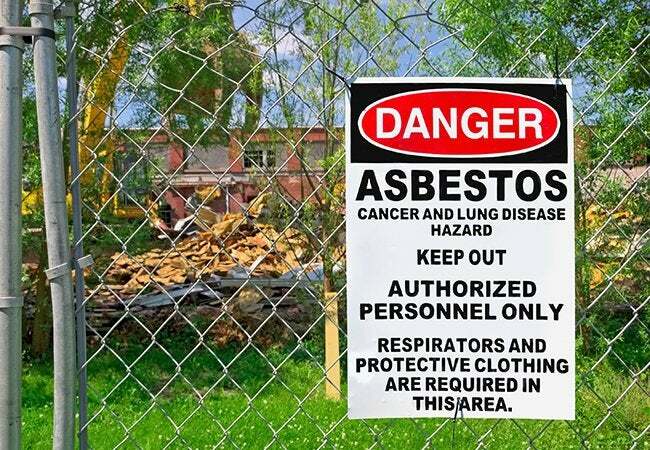 Removal of, or simply sealing up and disposing of asbestos (since you can’t take just it to a landfill), requires a special contractor’s license in most states. 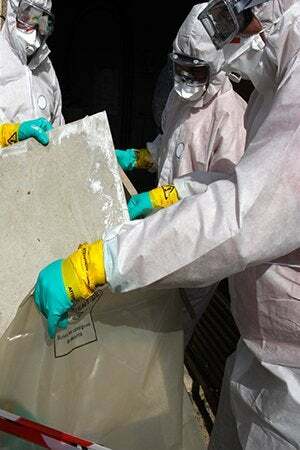 The many uses of asbestos in homes, its insidiousness, and the complicated process of delicately removing it mandate that it is not a project even the most ambitious of DIYers should ever undertake.